Please refer to our stock # 3451 when inquiring. This nice Japanese carved ivory Okimono group is an early 20th century piece. The base is 9” long and 6 ½“ wide. The sitting merchant is 4 ¾” tall, 3” wide and 2 ½“ in depth. 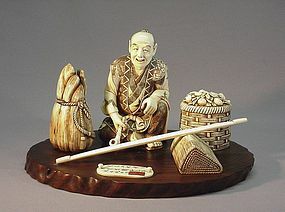 It depicts a smiling old man holding a tobacco pipe and displaying his merchandise in the market. The signature is placed on a small red rectangular hard stone which is inlayed on an oval ivory piece. It reads “SHOZAN”. It is in excellent condition.